Chenoa (population 1,845) is located on U.S. Route 24 at Interstate Highway 55 in northeast McLean County. Bloomington is a short 26-mile drive to the southwest of Chenoa. Chenoa was once a stop along the historic 2,200 mile U. S. Route 66, making it a part of the "Mother Road." Two railroad lines, the Illinois Central Gulf and the Toledo, Peoria, & Western, intersect in Chenoa. The town was founded in 1854 by Kentucky native Matthew T. Scott mainly for the farming potential in the area. Chenoa means "white dove" in Indian. Previous to 1854, the village was called Peoria Junction because of the intersecting railroad lines of the Chicago & Alton RR and the Toledo, Peoria, & Western RR. For more on the town of Chenoa check out their web site: www.chenoail.org. 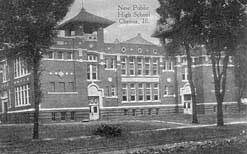 Early residents of Chenoa started a secondary (high school) education system for their children in approximately 1867.The first actual high school building in Chenoa opened her doors in 1877. The first four graduating classes had a total number of 23 graduates between them. The first graduating class of five students earned their diplomas in 1881. The schooling provided was very strong until consolidation talks started in the early 2000s. 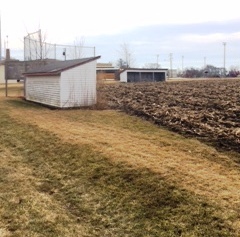 An effort between Chenoa and nearby Prairie Central High School in Fairbury took place. This became a reality in 2004 when Chenoa was annexed into the Prairie Central School District. 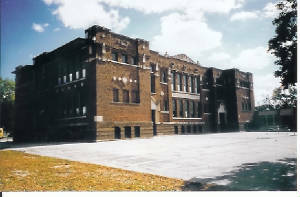 Prairie Central still uses the Chenoa high school building as a grade school, part of the Prairie Central School system. *The first Chenoa school was a "subscription school" (tuition-based) which opened in 1856. *The high school rented the third floor from the grade school from 1866 to 1877. 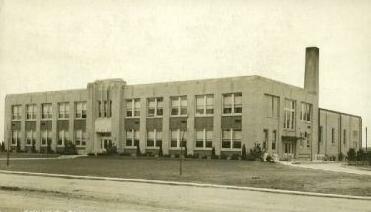 *The high school opened its own building in 1877, the same year that Alexander Graham Bell invented the telephone. The President of the USA was Rutherford B. Hayes. *The school colors were changed to Scarlet and Gray in 1924, prior to that the colors were "pale" blue and white. *Fred MacMurray, father of famous actor Fred MacMurray of "My Three Sons" and "Flubber" fame, graduated from Chenoa High School in 1898. 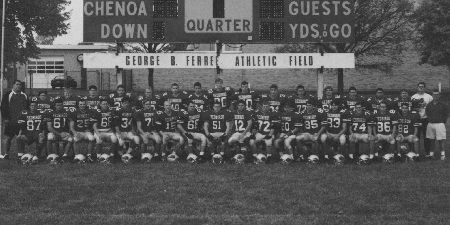 *Chenoa High School was the second school in state history to play football "under the lights" (Westville was the first). In 1928, Coach George Ferree's good friend Harry Good attached lights to the elm trees that surrounded Chenoa City Park where the home games were played. *The school fight song was written in 1931 by Wayne Auspurger, then a student at Chenoa High, who won the contest to promote school spirit. Previous to this song, Chenoa High School used the University of Illinois fight song for their own. *A great website to view more photos and information regarding Chenoa High School can be viewed at the following address: http://chs1972.homestead.com/index.html. It was created by CHS Class of 1972 alum Peggy Adams Cashmer and is an excellent tribute to the town and high school of Chenoa as well as the Class of 1972. And the ones who have fought for C.H.S.! The Chenoa High School Redbirds were successful on many levels in many sports throughout their existence. Boys baseball, basketball, football, track, and wrestling all brought home IHSA hardware (www.ihsa.org), while the Lady Redbirds competed in volleyball, basketball, softball, and track. The Redbirds competed in the Mid-State Conference along with their arch-rival Lexington and long-time rival Gridley (who also closed in 2004). The CHS boys attained great heights in football. Their many great seasons are listed below. Let's start with the big one. The Chenoa Redbirds could play some football! The Redbirds qualified for the IHSA playoffs 13 times. CHS finished 2nd in the 1A playoffs in 1979 and were State Champions in 1996!! 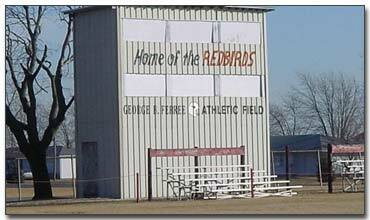 "Home of the Chenoa Redbirds - 1996 Class 1A State Football Champions"
Coach George B. Ferree got the Redbird program off to a running start in 1928, winning the Illini Conference title. 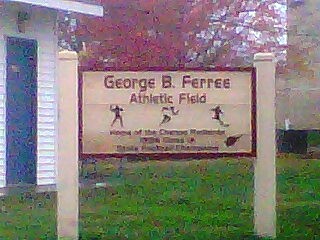 Coach Ferree stayed as the head coach through the 1949 school year, with some time off due to personal reasons and World War II. Coach Ferree and the Redbirds did not "duck" anyone. They played all the surrounding high schools including ones much larger than them including Pontiac, Washington, and Dwight. Chenoa's enrollment at this time was 120 to 130 students. His 17-year record at the school was a fantastic 90-43-9!! Coach Ferree is inducted as a member of the Illinois High School Football Coaches Association Hall of Fame. According to a Minonk-Dana alum, Chenoa had some great teams in the early 1950s as well. It is remembered by Bob Schmitz (M-D 1954), the Chenoa boys had a great game at the end of the their undefeated 1951 season when they defeated an also-undefeated Fairbury team with star athlete Bud Goslin in the last game of the season. 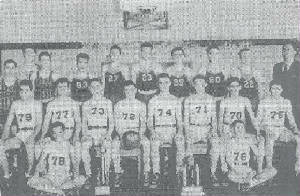 The Chenoa Redbirds of 1954 were also undefeated and have more than one all-state player on their team. In fact the Redbirds of 1951-54 did not lose a Conference contest, going 41-0 in that stretch. They won the first three conference games of the 1955 season before losing to Fairbury, stopping their incredible streak at 44 games! The great successes of the Redbird football program are listed below. Included are the thirteen Mid State Conference Championships won by CHS!! 11.0 - Rushing average (yards per attempt) by Josh Champion in 1998. 48.6 - Rushing average (YPA) by Champion against Gridley on September 20, 1997. He rushed for 243 yards on just five attempts! 190 - Rushing average per game by Jeff Hoselton in 1990. 284 - Rushes attempted by Hoselton in 1990. 22.9 - Average passing yardage for the season by QB Dan Butler. He threw for 916 yards on 40 completetions. 26 - Number of first downs accumulated by the Redbirds in their state championship game against Sciota Northwestern. 29 - Number of first downs accumulated by the Redbirds on October 11 against Flanagan. 51 - Number of rushing touchdowns. 74 - Number of rushing plays attempted by the Redbirds against Flanagan. 534 - Total points scored. 719 - Total rushes attempted. This is good for third-best in Illinois H.S. Football history. 797 - Total offensive plays executed (719 rush, 71 pass). 4,579 - Total rushing yards accumulated. 5,675 - Total offensive yardage accumulated. The boys baseball teams also had some very rewarding years. From 1955-1961, the teams compiled a record of 69-18 under Coach Robert Newell. The baseball Redbirds also won two Regional titles and four Conference Championships. The Chenoa Redbirds attained their greatest success in basketball during the 1940s and 1950s. The roundballers won two Regional titles and one District title. The 1948-49 team, led by Chenoa greats Stan Albeck and Bill Sarver, lost in the Sectional Championship game to Pekin by two points, making Chenoa one of the top 32 teams that year!! Chenoa was also known for its play in the Mid-State Conference and at the McLean County Tournament, winning those titles several times. Some scores from the IHSA State Tournament were located on a website titled "Illinois Postseason Basketball Scores." These scores are available below as well. 1922-23 through 1931-32 Postseason scores, record, and coaches' names needed. 1932-33 Normal District Tournament Coach's name & record needed. 1933-34 Dwight District Tournament Coach's name & record needed. 1934-35 Dwight District Tournament Coach's name & record needed. CHENOA (50): K. McGregor 19, Sarver 17, Erdman 8, Ferree 4, G. McGregor 2. SPRINGFIELD LANPHIER (46): Poos 21, Adamski 8, Scharafin 7, Cain 6, Kornfeld 4. PEKIN (54): Gerecke 20, Hughes 13, Van Horn 13, Busby 4, Rose 2, Nelson 2. CHENOA (41): Sarver 11, K. McGregor 11, G. McGregor 9, Ferree 8, Erdman 2. NORMAL (46): Spang 12, Schad 11, Gehrt 10, Smith 7, Halsema 6. CHENOA (44): Sarver 13, Albeck 10, Ferree 7, McGregor 7, Frankenstein 6, Kaufman 1. *Jim Jacobs (Class of 1984) - A three time all-conference selection (1982, '83, '84). Led the Mid-State Conference in scoring in 1983 (25.9 ppg) and 1984 (28.9 ppg). 1984-85 - 2003-04 Postseason scores, records, and coaches; names needed. Chenoa High School had at least one player that could "slam dunk" the ball. Redbird player Joe Moore competed at the Class A "Slam Dunk Contest" in 1994 and placed fourth. He had a preliminary dunk point total of 89, and 51 in the final round. In all, six different athletes won medals at the IHSA State Track Meet. The two medalists from 1929 fared so well that they earned a 5th place finish overall for the Redbird thinclad team. The award winners are listed below. These two were one of the few father-son combinations in state history to both medal at the IHSA State Track Meet! Both father and son earned third place medals; Rutt medaled in the javelin in 1925 and Dell earned his iron in the pole vault in 1956!! Ben played football, basketball, and track for the Chenoa Redbirds. His effort of 51' 6" gained him a third place finish in the old one-class state track meet. Ben was Mid-State Conference Champion in the Shot Put in the 1949 and 1950 seasons. He set the school Shot Put record for Chenoa High School in the Midstate Conference Meet in 1950 of 52' 8", a record which stood at CHS until she closed in 2004! Ben went on to play football at the University of Illinois and later at Illinois State University in Normal. He also set the then-school record for ISU in the Shot Put of 47' 10". Great job Ben Clark! The Redbird thinclads also won 12 Boys Track & Field Conference Championships!! James Grider - 400 Meter Dash '86, '87, '88. Also in 1988, James Grider won the 100 Meter Dash and anchored the winning 4 X 400 and 4 X 800 Meter Relay Teams!! During his four years at CHS Grider won a total of 6 golds, 3 silvers, and 3 bronze medals in Mid-State Conference Varsity Meet action. Grider also earned varsity letters in wrestling and track his freshman year and in football, wrestling, and track his sophomore, junior, and senior years for a total of 11 varsity letters at Chenoa High School! James Grider is the son of CHS graduate Danny Grider (Class of '57). The success of the boys wrestling team is also well-documented. As a team, they did not win any IHSA hardware; however, they did have some individual state medalists as well as some nice season records. The IHSA also holds competition in academic and speech areas as well. The following Chenoa High School students were Individual Events Speech Medalists. In addition the Drama Team won a District Title. Girls basketball, volleyball, softball, and track were offered to the Chenoa Lady Redbirds. We have received some conference information on the Lady Redbirds which will be listed below, courtesy of Mid State Conference historian Merlin Haas. If you have any additional information you can share regarding the girls' athletic program, please e-mail us at eganann@sbcglobal.net. The Lady Redbird netters had two nice seasons under Coach Betsy Palmer. The 1982-83 team even won the Mid State Conference Championship! Chenoa High School girls basketball had some real nice seasons in the 1980s. Included were some great records and a conference championship during the 1989-90 season. The Lady Redbird thinclads scored a near-miss in the 1980-81 season, taking second place in the Conference track meet (coming up a half-point short) to Streator Woodland. Sue Peters was a 3-time Conference Champ in the 400 Meter run winning the event in 1980, '81' and '82. She also won trhe High Jump, 100 Meter Dash, and was on the 1st place 800 Medley Relay team. Chenoa High School offered a "total" experience for its students to enjoy and participate in. The Music Department was once such entity. The band participated in competitions and played in many functions for Chenoa. A yearly award was given to an individual band member and was called the John Phillip Sousa Band award. James Grider won this award in 1985, 1986, and 1988. If you have any further information regarding the Chenoa High Music Department, please forward it to us at veemonster1@aol.com. The Chenoa High School experience included a top-notch F.F.A. program. The sponsor for many years was Howard Zimmerman. If you have any information you would like to add about CHS' FFA program, please send it to us via e-mail. *Stan Albeck (Class of 1949), player on the the 1949 basketball Regional Champions who would lose to Pekin in the Sectional Championship game in a two point heartbreaker (see #70 in front row of 1947-48 team photo above). Stan Albeck went on to become Head Basketball Coach of the Bradley University Braves and later a stint in professional basketball as Head Coach of the Chicago Bulls! *Bill Sarver (Class of 1950), player on the 1949 basketball Regional Championship team who also went on to a great career at what is now known as Illinois State University. *Ben Clark (Class of 1950) - Three sport standout set school record in shot put which stood for 53 years. Went on to star at Illinois State University, playing football and setting the school Shot Put record there as well. *Tom McIntyre (Class of 1961), newscaster for Peoria's NBC affiliate Channel 25 News team. Check out his biography at http://www.week.com/News25Team/bio.aspx?bioID=46 . *John Capasso (Class of 1976), current Superintendent for Prairie Central High School. Former Superintendent of Leroy and Minonk Fieldcrest high schools. Former star of many musicals at Chenoa High School. "I graduated at Chenoa H.S in 1976. I was reading an article about FHS and the name Howard Zimmerman was mention. He gave me some classes in H.S, I had a lot of respect for him and I was wandering if I can get some information about him? Also, I remember Victor Palomino, my english teacher. Do you have an e-mail for him? I was an AFS exchange student back in those days and that year was very special because of the bicentenial. I enjoy so much my staying there and learn so much about this wonderful country call America. I also enjoy the pictures of the 4th of July and looked at them carefully in hopes to find someone I knew from those days. I also remember John Capasso, he was a very sharp and inteligent young man. We always knew that he was bound for success. Those days were wonderful and full of memories. I also participated in a play that year called "Arsenic and Old Lace". I'm an architect and have a designing and construction company with my wife. She is also an architect. If I can find any info about those of whom I have written, I would deeply appreciated it. "Chenoa High School will live forever in our hearts."